TUCSON, Ariz. - Alex Joyce’s mom didn’t believe in vaccines when he was growing up. “She was into alternative medicine. So she chose not to vaccinate me when I was a child," says Joyce. As an adult, Alex made his own decisions when it came to healthcare. “When I was about 35 and we were expecting our first child, my wife and I decided that it would be a good idea to go through and get all of my vaccinations that I would’ve had as a child," says Joyce. 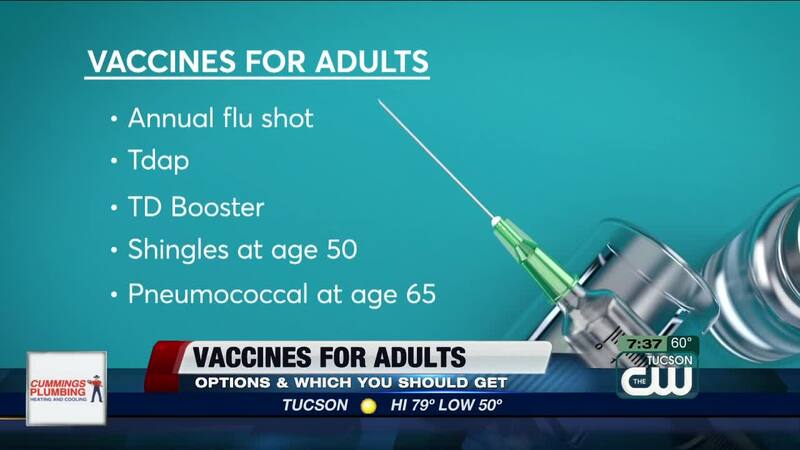 Even if you’re not like Alex and you were vaccinated as a child, doctors recommend several vaccines for adults: An annual flu shot, a Tdap vaccine, if you haven’t already received it, and a TD Booster every ten years to protect against tetanus and diphtheria. Then a shingles vaccine at age 50 and at 65, one for pneumonia. Another vaccine some adults are considering protects against HPV, or human papillomavirus, which can cause cancer in women and men. “For a lot of adults today, the HPV vaccine wasn’t even available when you were a teenager," says Consumer Reports Health Editor, Lauren Friedman. The Centers for Disease Control and Prevention recommend the HPV vaccine for women through age 26 and men through age 21, although the FDA has approved the vaccine up to age of 45. Worried about that “icky feeling” you might get after a vaccine? CR says a shot might cause some mild side effects like a sore arm or even a slight fever. But if you do get sick after being vaccinated, it’s probably just a coincidence. If you're planning to get the shingles vaccine, you may have to wait. There has been a shortage of the new two-dose vaccine, Shingrix, which was approved in 2017. So, check with your doctor or pharmacist to see if they have it. If not, try to get on a waiting list or check other pharmacies in your area. Have more questions about adult vaccines? Consumer Reports answers four common questions about the shots health experts say adults need. Click here for more information on that.